Philae lander's down-looking descent ROLIS imager obtained this image when it was about 131 feet (40 m) above the surface of Comet 67P/Churyumov-Gerasimenko. Europe's Philae lander is expected to drill into the surface of its comet for the first time as the probe might be running out of battery life, European Space Agency officials said today (Nov. 14). The Philae lander deployed its drill down to the surface to start taking samples of Comet 67P/Churyumov-Gerasimenko today. Officials are hoping that the drill reached the comet's surface, and that data collected during the experiment will be sent back to Earth before the probe's battery dies. "This is unique and will be unique forever," Andrea Accomazzo, ESA Rosetta flight director, said of the historic landing in a webcast today. "Let's not forget this." The drill's first samples will be used in the COSAC (short for Cometary Sampling and Composition Experiment) instrument, Philippe Gaudon, Centre National d'Etudes Spatiales Rosetta project manager, said during the webcast. That Philae experiment "detects and identifies complex organic molecules," like water and carbon compounds, which could have bearing on how the solar system was seeded with water, according to ESA. Scientists are worried, however, that the drill didn't reach the surface of the comet. In its current position, the drill might be out of reach of the ground, according to ESA officials. "The drill has to make quite a distance," Valentina Lommatsch, of the DLR-Lander Control Center mission team, said during the webcast. "We'll have to hope that it reaches the ground. It's hard to say." Officials were initially concerned that using the drill instrument would be risky. Philae bounced twice before coming to its current landing spot after its initial touchdown on Comet 67P/C-G after it was released from the Rosetta orbiter on Nov. 12. The lander never deployed its harpoon system used to keep it tethered in place on the surface, so mission controllers were initially concerned that the force of the drill might move Philae into a more precarious position. But they went ahead with the experiment anyway. ESA officials are also concerned that the lander is running out of time to conduct science. Philae's initial landing spot would have given its solar cells 6 to 7 hours of sunlight per day, but now, the lander is in the shadow of a cliff and only receives about 1.5 hours of sunlight. The lander is probably in the process of using up the last of its stored battery life, officials said. Mission controllers are currently out of contact with Philae due to the comet's orbit, but they are hoping to regain a connection later tonight, when more science data should be beamed back to Earth. 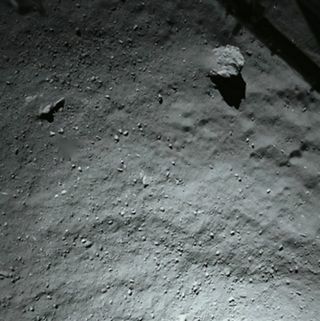 "We are hoping to get contact again this evening," said Stephan Ulamec, Philae lander manager at the DLR German Aerospace Center. "This would be fantastic, but it's not secured. So maybe the battery will be empty before we get contact again." Even if Philae totally depletes its battery life, it is still possible that if Rosetta lines up with Philae as sunlight hits the probe's solar panel, it could beam back more data to Earth again at some point in the mission, Lommatsch noted. Mission operators still aren't exactly sure where Philae is in relation to its first landing site. Officials think the lander bounced about 0.6 miles (1 kilometer) into space before coming back down for its second landing. It then hopped a short distance in the comet's low gravity to come to rest where it is positioned now. Scientists still aren't exactly sure of its orientation, and officials are using the Rosetta orbiter's imaging system to hunt for the lander.